In what could only be described as a freak accident, a veteran New York State Trooper was killed on Sunday, August 3rd, when he was electrocuted while assisting in changing a flat tire on a vintage firetruck. Trooper Shawn W. Snow was assigned to the commercial vehicle enforcement unit of the New York State Police and was responsible for inspecting trucks crossing the Ogdensburg-Prescott International Bridge and local roadways. On Sunday, at approximately 4:40 p.m., a vintage fire truck from the Canadian Fallen Firefighters Foundation was being returned to Canada from a parade near Syracuse when a tire went flat near the Ogdensburg-Prescott International Bridge located about an hour south of Ottawa. Trooper Snow went to assist the vehicle's driver in changing the flat and was underneath the truck fixing the tire while the driver of the vehicle, Pierre Surprenant of Quebec, Canada, was extending the truck's ladder to distribute the weight away from the flat right rear tire. As the truck was being jacked up the ladder suddenly dropped and hit a high voltage power line which electrified the area and killed both men instantly. "How it ended up touching the wires, whether a piece of equipment failed and it slipped and touched the wires, or whether the act of jacking it up higher on one side caused it to touch, we just don't know yet," said Ogdensburg Police Chief Richard Polniak. 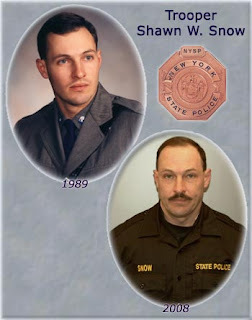 A 19-year veteran of the New York State Police assigned to Troop B, Trooper Snow, age 47, leaves behind his wife Penny and two sons Eric and Jamie; three step-children Shelby, Heather, and Tony Hughes; his parents; two brothers; two sisters; and three grandchildren Mackenzie, Nolan and Jacob. Hugs, thoughts and prayers to his family and friends.